Nearly all the seagrass in Biscayne Bay is dead. Andrew February 22, 2019 Conservation, News, RECENT, Slide No Comments on Nearly all the seagrass in Biscayne Bay is dead. Nearly all the seagrass in Biscayne Bay is dead. County commissioners want to know why. The past decade has not been good for Biscayne Bay: More than 25,000 acres of seagrass meadows have vanished as Miami boomed and climate change drove seas ever higher. Turtle grass. By James St. John. License. Photo cropped. In a report released last week, Miami-Dade County environmental regulators blamed chronic pollution for the massive die-off, brought on by dirty canals, increasing floodwater and leaky septic tanks in older neighborhoods. The once gin-clear bay — one of the few places on the planet inhabited by all seven species of seagrass — now has wide swaths of barren bottom, muddy water and clumps of macroaglae rolling around like tumbleweeds. But on Tuesday, the bay enjoyed a mini love fest when county commissioners ordered not one, but two reports on how to fix problems. 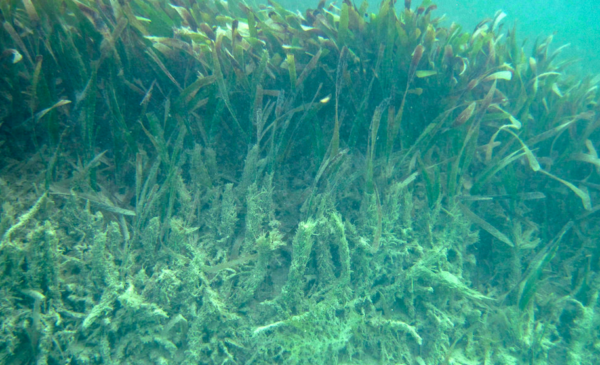 “While we need to continue studying, we also need to identify solutions before there’s nothing left,” said Commissioner Daniella Levine Cava, who asked for the seagrass study.